neighbourhood April 24, 2009 to celebrate Earth Day. Dozens of people who live and work on the Waterfront joined in the annual 20 minutes of spring clean up that took place throughout the city. Here is the Mayor and our popular Councillor (in blue) with YQNA members Ulla Colgrass and Bob Rasmussen, ready with their plastic bags and gloves to get to work. Bags were filled with food containers, cigarette buts, coffee cups, broken glass – even a rusted bicycle wreck was removed! 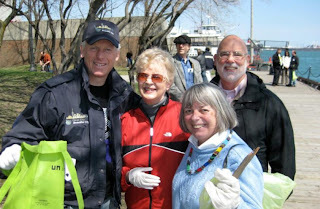 I enjoyed the Central Waterfront Walk on Sunday, May 4 at 11am. It was a pleasure to meet approximately forty other participants who were from this neighbourhood, different parts of Toronto, Etobicoke and from Richmond Hill. There were tourists from New Jersey and an urban planning student from Germany. The appreciative group were a variety of ages including a newborn baby! The tour was led by Braz Menezes who was well assisted by Doug Dempsey, Ulla Colgrass and Bob Rasmussen. These energetic tour organizers are members of the York Quay Neighbourhood Association. 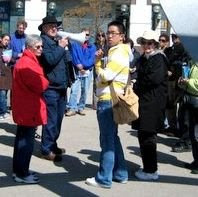 The tour started at Yonge Street and Queens Quay with a route along Queens Quay to the York Quay Park and back along the lake side board walk. The tour ended at the Marine Police Unit. It was interesting to learn about the history of this area, to see interesting works of art and to understand the many challenges of this important part of Toronto. To address highlights of the area, the tour organizers arranged to have wonderful speakers present specific topics. Pina Mallozzi, from Waterfront Toronto, talked about future plans. Jo Ann Roberts, an information officer from Harbour Front Centre, was an enthusiastic presenter of all the activities happening there. Police Constable Rick Arsenault told us about the responsibilities of the Marine Unit and took us inside the boat shed for a closer look at the various types of boats. Kevin Currie, from the Queen’s Quay Harbourfront Business Improvement Association, explained their initiatives, a recent marketing survey and upcoming events. All the guest speakers were generous with their time and talents and happily answered a variety of questions from the participants. The walk was informative, relaxed and made us more aware of how important it is to make this unique neighbourhood a “people place”. With Toronto’s budget on the verge of being balanced, a new threat looms as legislation is set to pass in Ottawa that would give the Toronto Port Authority access to our city’s hard won federal infrastructure funds. The TPA, a federal agency, with no local accountability was criticized by the recent Tassé report as being unresponsive to the needs of the community. Now, Stephen Harper’s Conservative government has struck a deal with the Federal Liberals to make amendments to the already controversial Canada Marine Act that governs the TPA. The amendment covered under Bill C-23 will give even greater power to arms-length Port Authorities across Canada and allow them to become eligible for public funding that is currently held and controlled by municipal government’s infrastructure funds. “One of the proposed amendments to the Canada Marine Act will fundamentally change the requirement that Port Authorities are to be self-sustaining. In the case of the Toronto Port Authority, we have an example of a Port Authority that has consistently run substantial operating losses every year – in the millions. We fear that this amendment opens the door to the TPA covering those losses through applications for funds that are essential to other municipal needs such as running community centres or removing snow and garbage” says Bill Freeman of CommunityAIR, a non-profit group representing many Toronto waterfront communities. Freeman will present a fact sheet to the Standing Committee on Transportation, Infrastructure and Communities which tallies over $110 million in subsidies paid to the TPA, and lists examples of how the federal agency mishandled public funds on ventures like the $9 million spent on the ill-fated Rochester Ferry Terminal. Joining Freeman, in Ottawa is Brian Iler, past commodore of the Alexandra Yacht Club and Toronto City Councillor, Adam Vaughn, whose ward contains the TPA run Toronto island airport. They will voice their opposition before the committee on Tuesday, February 5 at 11 a.m. Now in its final stages, they hope the Bill will be blocked from passing through the House later this month. With the recent announcement of another Conservative party loyalist to the Toronto Port Authority’s board there are fears that Bill C-23 will further erode the TPA’s accountability to the Toronto public. Craig Rix, whose appointment to the TPA was made by Transport Minister Lawrence Cannon last week, was an aide to Finance minister Jim Flaherty when he was a member of the Mike Harris government in Ontario. The Canada Marine Act requires that four different classes of port users be represented in the makeup of the TPA’s board, yet none of its current members appear to meet this particular requirement. The Queen’s Quay Harbourfront Business Improvement Area (QQHBIA) has launched its ‘Strategy for the Transformation of Queen’s Quay’, tapping into the creativity of student planners. It began with a meeting that was attended by twelve planning students in their final year at Ryerson University and their Associate Director and Professor, Mitchell Kosny, MRCP, Phd. Also attending were representatives from Harbourfront, the QQHBIA, Bathurst Quay Neighbourhood Association, the St. Lawrence Neighbourhood Association, York Quay Neighbourhood Association, and Waterfront Action. Local business representatives included Ms. Chinyere Eni, Branch Manager of the Royal Bank of Canada, located in the Queen’s Quay Terminal Building and Kevin Currie, of Wheel Excitement. 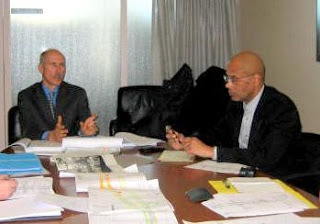 YQNA’s Planning member Braz Menezes, who conceived the project, also chaired the meeting. At the meeting the students were given a list of priorities and then asked to prepare a strategy for the economic and physical transformation of Queen’s Quay over the next few years. There will be a mid-session review of the student’s work near the end of October. They will present their final report later and all will be invited.